The store just isn't convenient at all for me to get to. Feels so out of the way. But, there were some gluten-free flours I needed to pick up for a special surprise for my sister for Thanksgiving and I knew this place would have the items at a minimum $1 cheaper than Whole Foods (typically 2-3 dollars less actually). Plus, I could stock up on my PB2. Do you have any stores that you really like, but that are sort of out of the way from your normal routes? Is it worth making the special trip to save a few bucks? Honestly, mileage it's no different than most of the other stores. It just happens to be located next to nothing else I would ever stop at. So definitely not on the way - and that's how I approach my errands, mapped out, right hand turns, bam bam bam. My little errand ended up going much faster than expected even with rush hour traffic. I had plenty of time to just relax a little while listening to music - loving the Norah Jones station/channel (whatever it's called) on Pandora. I have a nice little mix going with anything from Norah Jones and Mazzy Star to Jack Johnson and John Mayer. As soon as the sun started going down, so did the temps. We're in for a cold, crisp night (32 degrees). That called for soup in my mind. I went with a Spicy Curry Pumpkin Soup. I just picked up some pumpkin today and it was already calling my name. 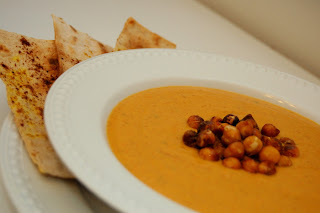 I also made up some Roasted Curried Chickpeas to add to the soup. I love adding a little bit of crunch and texture to a creamy soup. In medium pot, saute onions and carrots in broth with just a sprinkle of salt. Allow to simmer until carrots soften, approximately 20 minutes. Stir in pumpkin and half the can of coconut milk. Remove from heat and transfer to a blender or food processor. Add in the tofu and puree until creamy. Return to pot and stir in remaining coconut milk, curry paste, and spices. If too thick, add additional broth. Allow to simmer until flavors begin to come together, approximately 10 minutes. On a small baking sheet, combine all ingredients so that the chickpeas are well coated. Bake until chickpeas are toasted and crunchy tossing at least once, approximately 30-35 minutes. 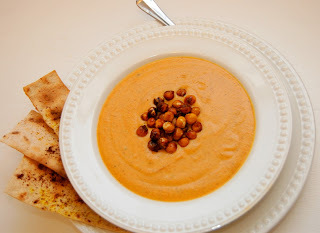 I love having something to dip into my soups so I went with some lavash bread that I seasoned with some curry powder and garam masala then toasted up quickly. I love how light and crisp lavash gets when toasted. This turned out so good. It was rich, creamy with just enough heat but not enough to blow your lid off.